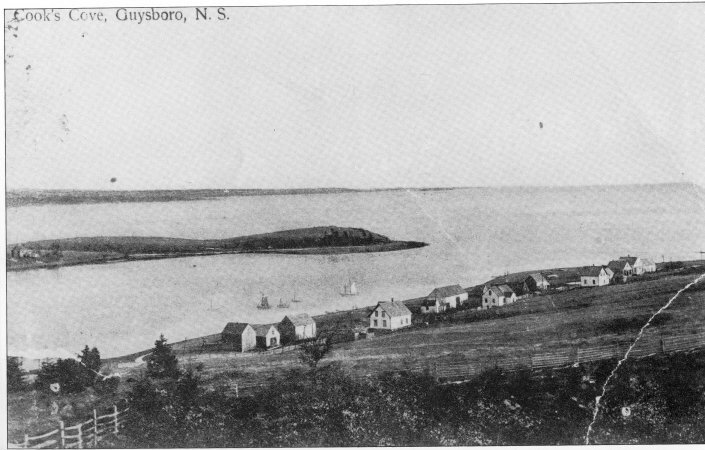 Like many coastal communities along the shores of Guysborough County, Cook's Cove was named after its first pioneer settlers. Around 1770, Elias Cook of Marblehead, Mass. Constructed a permanent residence at the head of Cook's Cove, on a hill overlooking Chedabucto Bay. Elias was a fisherman/farmer from Mass. Who was familiar with the area due to the fish trade. His house was built from sawn lumber and remained until 1845, when the road was shifted to its present location and a wharf was built at the Cove. A second house was then built by Elias" grandson William. Also around the 1770's, a number of other families were settling in the Cook's Cove area. These included Nathaniel Tobey, Isaiah Horton, Godfrey Peart, Benjamin Godfrey, Robert Callahan and Joseph Hadley. The majority of these settlers and their families farmed and fished. Joseph Hadley is known to have conducted a trading and mercantile business at his homestead at the entrance to Guysborough Harbour. These families inter-married and a strong sense of community developed. Their presence remains today as certain geographical features reflect their life here. These places include: Cook's Cove, Horton's Cove, Godfrey's Brook, Tobey's Point, Hadley Point and Peart's Cove. After the settling of the loyalists in nearby Guysborough in 1784, these seven old families received grants of their own after working and living on the land some fifteen years or more. It is believed that Joseph Hadley was here as early as 1765, as he had a separate grant given to him for services rendered during the fall of Louisbourg. His grant covered some 15,000 acres of land in what is known as Lower Manchester. These early settlers were of the Anglican and Methodist faiths. Two pioneer cemeteries can be found in Cook's Cove and on Joseph Hadley's property. Although only beach stones mark the plots, the graves are still visible to the careful eye. Recorded at the Registry of Deeds in Guysborough is a transaction between Elisha Toby (Nathaniel's son) and the Methodist Society, whereby Toby gave land to the society so "a proper chapel or place of Public Worship should be built and erected for this accomodation and that a regular ordained clergyman should be settled amongst them and that a place for burying their dead should also be set off and appropriated". This deed bears the date May 3, 1820. Eventually, a second Methodist Church was built, quite likely in the mid 1860's on top of the hill where Mr. Donald Worth now resides. It is known that a schoolhouse was operational in Cook's Cove before 1825 as H.C. Hart mentions that date in her book as being the time when meetings were held at Cook's Cove to elect new trustees. A second schoolhouse was erected beside the second Methodist Church some time later. Teachers resided in the Charles Cook house, across the road from the school. Time has had its toll on Cook's Cove as very few of the old families remain and the old farm grounds are now overgrown. However, the new TransCanada Hiking Trail now intersects the property of Elias Cook, and a wonderful view of Cook's Cove and Chedabucto Bay is available for tourists and nature lovers, which gives us a greater appreciation of the lifestyle the first settlers of Cook's Cove lead.